Here are a few ways to potentially profit. With bitcoin hitting record high prices recently, many investors are wondering if they should jump on to the cryptocurrency bandwagon. I'm not a fan of buying the digital coins themselves for investment purposes, but there are other ways to invest in bitcoin and the technology behind it. One way to set yourself up to profit from the growing popularity of bitcoin is to invest in companies that themselves invest in bitcoin, or in the underlying blockchain technology. To be clear, I'm not talking about investing in over-the-counter stocks whose only business is investing in bitcoin. Most of these companies are extremely hard to evaluate, and as I've written before, investing in penny stock-type securities is a good way to lose all of your money. Instead, I'm referring to companies such as Goldman Sachs (NYSE:GS), which in 2015 led a round of funding for bitcoin start-up Circle Internet Financial. In fact, there's an investment group in Goldman, known as the Principal Strategic Investments Group, whose main mission is to invest within the financial-technology space -- that is, technologies Goldman could conceivably use in its own business. You can read more about Goldman's investment in this 2015 article I wrote, but the point is that Goldman is a well-established company that could reap the benefits of bitcoin. Another way to potentially benefit from the increasing popularity of bitcoin is to invest in a retailer that accepts the currency. However, much of the retail sector hasn't been doing too well, so be sure to do your due diligence before investing in any of these companies – especially any brick-and-mortar retailers. Having said that, here are a few of my favorite bitcoin-accepting merchants that I think have bright futures ahead of them. Note that this is not an exhaustive list of companies that accept bitcoin as of this writing. Overstock.com (NASDAQ:OSTK) was the first major online retailer to start accepting bitcoin and has now done so for more than three years. Overstock is partnered with leading bitcoin exchange Coinbase, which creates a seamless "Pay With Bitcoin" option at checkout. Shopify (NYSE:SHOP) is an e-commerce platform that allows its merchants the option of accepting bitcoin payments. Since Shopify has more than 400,000 merchants, this could grow into a big source of bitcoin transaction volume. Satellite-TV provider DISH Network (NASDAQ:DISH) also partners with Coinbase for bitcoin transactions and was the first subscription-based TV provider to do so. Although it's not really a retailer, Microsoft (NASDAQ:MSFT) accepts bitcoin as payment for products and services. Specifically, the company allows customers to use bitcoin to add money to their Microsoft accounts, which can then be used for purchases at Microsoft online stores. One final "investment" I'd like to mention is the Bitcoin Investment Trust (NASDAQOTH:GBTC), which was created to allow investors to pool money and buy bitcoin like a stock or ETF, as opposed to setting up a separate account with a bitcoin exchange and buying coins directly. 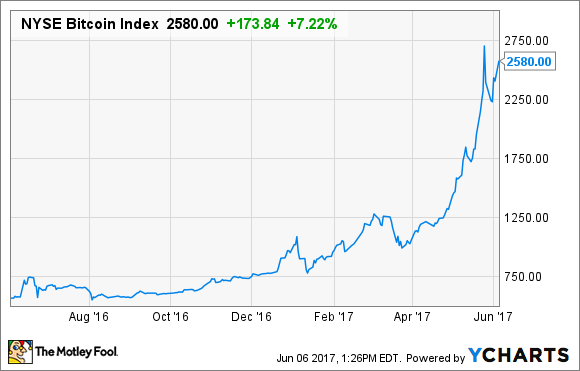 However, as my colleague Jordan Wathen pointed out in a recent article, this is perhaps the worst way to invest in bitcoin. Shares of the trust trade at an incredibly hefty premium to the value of the bitcoins the company owns, and the trust's 2% annual management fee will slowly eat away at the value of your investment. Because of these two factors, it's entirely possible that investors in the trust could lose a substantial amount of money, even if the price of bitcoin continues to climb. As I mentioned, I'm not a fan of holding actual bitcoins for investment reasons, but even that seems like a better idea than investing in this trust.